Why don’t we leave it all to God? Over the 5 years we’ve run TB Joshua Watch, we’ve had a lot of responses from pro-TB Joshua readers. One of the most common objections we get is “don’t fight God’s battles, leave it to him – if TB Joshua isn’t of God, God is perfectly capable of taking care of him”. The more biblically literate critics would often cite the story of Gamaliel, the pharisee who saved the apostles lives in Acts 5 by famously warning the council “keep away from these men and let them alone, for if this plan or this undertaking is of man, it will fail; but if it is of God, you will not be able to overthrow them. You might even be found opposing God!”. What should we make of this advice of Gamaliel? It was good that he gave this advice at the time he gave it, it saved the apostles lives which in turn resulted in continued growth and strengthening of the church. But taking this account and making it a universal principle is misguided. Do you really think this one account completely neuters the churches ability to call out false teaching? Can anyone claim they have heard from God with total impunity, because we have to “leave it to God in case we be found opposing God”? Should we assume that any religious movement that doesn’t quickly fail is “of God”? Of course not! If this were the case, it would nullify many teachings of Jesus (who warned frequently that we should be on the look out against false prophets), it would mean Paul was mistaken to call out false prophets by name (2 Timothy 2:15-18) and it would mean Jesus was wrong to commend the church of Ephesus for testing those who called themselves “apostles” and finding them false (Rev 2:2). More to the point – if you tell us we should “leave it all for God”, we hope you’re consistent enough to say the same to TB Joshua. After all, he’s well known for diagnosing people as having “demons” and “casting them out”. Why can’t he leave it to God? Does God need him to fight his battles? God delights when we serve him, even though he doesn’t need it. Does he need us to preach the gospel? Does he need us to pray for the sick? Does he need us to give to the needy? Does our righteous living make him any more “God-like”? The answer to all these questions is of course an emphatic NO! But we all recognise these as important elements of the Christian life. So too is warning people about “deceitful workers disguised as apostles of Christ” (2 Cor 11:13). By all means disagree with our conclusions regarding TB Joshua, but don’t lazily object to it because you think it should be left to God. Nobody really believes this, and even the people who use this objection are quite happy for others to “do God’s work”, as long as they agree with them. From the comments: What is love? Occasionally we get a particularly insightful or helpful comment and we like to feature it as a post because many of our readers only read the articles and don’t follow the comments. The following post comes from a comment from D Haile, and is a powerful reflection on what it really means to “Love one another” and what the true motive behind TB Joshua Watch might be. If you are a supporter of TB Joshua, we encourage you to read this slowly and prayerfully so you can understand why we do what we do. We love you. If I see my little boy about to run into the road, because as a little one he cannot see or recognise the dangers, and I yell and scream and grab his arm to stop him from being injured or killed, is that not love? Am I not loving my son by saving him from pain and death? If I see my grandfather about to drink from a bottle that says “poison” clearly on the outside, but his vision is poor so he can’t see it, am I not loving him shouting at him to stop and by hitting the bottle out of his hands? Is that not love? If we figuratively shout at you all because we see the danger that you do not, of following a charlatan, a false prophet, a wolf masquerading in sheep’s clothing, is that not love? Did Jesus not love the money changers and traders in the Temple when he whipped them out of there? Was that not love, love for them (to stop them from sinning) and love for the people they were conning? Love is not fairy-tales, love is Truth. Love is not “live and let live” or being ‘nice’, love is action. Love is not feeling, love is doing. Love is not keeping quiet for fear of offending, love is shouting the Truth from the rooftops. The day we stop warning you and all your loved ones and friends of the danger that you are in following TB Joshua, that is the day we stop loving you, stop showing love, stop obeying the Lord Jesus when He COMMANDED us to “love one another”. TB Joshua Watch, and Just Wonder and Mr Terrific and Bisola Johnson and all the other commenters on this blog are wasting hours of our time coming here to respond to comments like yours, not because we hate you or TB Joshua, but because we love you and we would like to see you saved from the pit that you don’t know you are in. I know you will read this comment and think it all lies – how can we love all of you when we ‘attack’ your prophet? – but TB Joshua is not really our worry. He knows who he is and what he is and what he is doing. He is not a stupid man. He is a very clever man doing very clever things. Our worry, our concern, is YOU. All of you who follow him. You cannot see what he is doing because you are deceived. And you don’t know you are deceived because you are deceived. You will read this with anger in your heart (“How dare she suggest I am deceived? No one has deceived me. T B Joshua is a Man of God and I love him as my papa”). But if you can, just for a second, stop and think. When was the last time you spoke to the Lord Jesus yourself, on your own, without following a prayer led by T B Joshua or following a prayer guide or similar that he has written? When did you last ask Jesus to reveal his Truth to you? When was the last time you asked questions about what you are being taught? When was the last time you read the Bible for yourself, without being directed to certain verses by TB Joshua, Emmanuel TV or one of the Wise Men (are they still around?)? When was the last time you read more than a chapter of the Bible at one time, to understand better the context and co-text of the verses you know? Who do you truly love more – the Lord Jesus (who died on the Cross for your sins, rose on the third day and ascended into Heaven and is now sat at the right hand of the Father) or TB Joshua (a man made in the likeness of God (as we all are) but not God)? If you remember Jesus said “If you love me you will obey my commands”. Well, whose commands do you obey more – Jesus or TB Joshua’s? This last question will tell you all you really need to know about your relationship with God. If ANYONE sits above Jesus in your heart, you have a real problem, my friend. You need to decide who is more important to you – Jesus your Saviour or TB Joshua, your prophet. Be careful how you choose. And not choosing is also a choice – a choice not for Jesus but for something or someone else. In this post, guest author Claire looks at what the bible says about the nature and purpose of prophecy. Over the last three years, TB Joshua Watch has publicised aspects of TB Joshua’s ‘ministry’ that to some of us raise concerns. This sites has raised concerns about particular aspects of Mr Joshua and SCOAN – in particular ‘healings’ that have not been proven to be the case, the apparent cult like nature of SCOAN and prophesies that are not all that they appear. Some of those commenting on this site accuse Mr Joshua of being a ‘false prophet’ whereas others fervently support him and claim him to be a ‘man of God’. In this article, I want to look at prophecy and what the bible actually says about it. In many of the videos that this site has linked to, Mr Joshua is shown predicting some terrible event (a plane crash, a mass shooting) and asks the audience to pray. These videos are re-publicised after an event to show that he did indeed forecast the event (although often this site contends that these videos are edited or vague and therefore cannot be said truly to forecast anything). But while the Bible tells us to test prophecies to see if they are true, it also gives us some broad principles that we can use to understand whether what Mr Joshua does is prophesy even if it does come true (or could be perceived to be). Firstly, the clearest instruction is in 1 Corinthinans 14 v3 ‘But everyone who prophesies speaks to men for their strengthening, encouragement and comfort’. Do Mr Joshua’s ‘prophecies’ do this? Well the ones I have seen (and I am no expert) don’t. They seem to focus on a potential tragedy and ask people to pray, but I do not see how this causes strengthening, encouragement and comfort. In John 16 Jesus talks to his disciples about the Holy Spirit: ‘But when he, the Spirit of truth, comes, he will guide you into all truth. He will not speak on his own; he will speak only what he hears, and he will tell you what is yet to come. He will bring glory to me by taking from what is mine and making it known to you.’(v13,14) A prophecy should tell you what is to come and should bring glory to Jesus. Even if you believe that Mr Joshua does indeed prophesy the truth, I do not see how his predictions of tragic events bring glory to Jesus. Now I am sure that there will be some people who fervently trust Mr Joshua and who will feel strongly that Mr Joshua is not encouraging them to follow other gods, but these people should accept that these verses do at least show that the fact that a prophecy comes true does not mean it comes from God. I dispute that Mr Joshua’s ‘prophecies’ come true, but those who believe they do cannot rely on this to ‘prove’ that these ‘prophecies’ are therefore from God. Deuteronomy 18 v22 tells us that if it doesn’t come true it can’t come from God, Deuteronomy 13 v1-4 tells us that that doesn’t mean the opposite is true; if a prophecy does come true, that alone doesn’t mean it comes from God. If it comes from God it should lead us to God. I’m not convinced that Mr Joshua’s ‘prophecies’ do this. Did it provide strength, encouragement and comfort? Did it bring glory to Jesus? Does it lead us to God? Was it brought in love? It is up to all of us individually to test Mr Joshua’s ‘prophecies’ vigorously. Those who are sceptical must not test with a hardened heart, looking for evidence that they are not true; and those who believe should remember to test properly and not simply accept each ‘prophecy’ because it falls from the lips of Mr Joshua. As with the previous blasphemous statements, this was broadcast on TB Joshua’s Emmanuel TV station, without any correction or rebuke. As any occasional Emmanuel TV viewer will be aware, SCOAN make a habit of interviewing “demons” before casting them out, in direct contrast to Jesus’ practice of keeping them silent (Luke 4:35). In fact, Emmanuel TV often seems to contain more messages from “demons” than scriptural content. A reader recently pointed us in the direction of a particularly shocking deliverance video. A woman, who we are led to believe is channeling lucifer, is interviewed for about 20 minutes by a “wise man”. At the climax of this interview, lucifer claims that TB Joshua is sent to liberate the world, not just Nigeria, but the world at large. This statement is then repeated, both times to whoops of delight from the congregation. 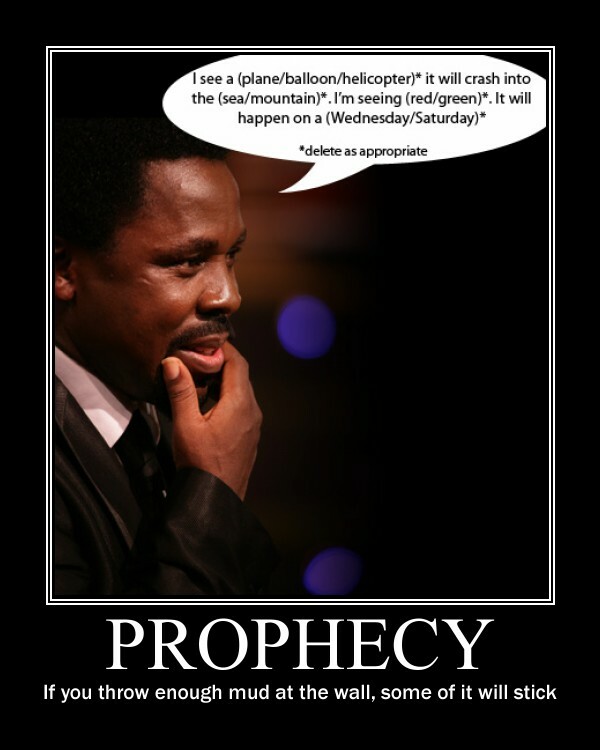 Though we’re used to TB Joshua’s “win/win” prophecies, in this case we actually have a “lose/lose” scenario. The bible teaches us that satan (lucifer) is the father of lies “…there is no truth in him. When he lies, he speaks out of his own character, for he is a liar and the father of lies.” (John 8:44b). Either we believe this really is lucifer speaking and so assume it is a lie, or we assume the lady is acting, therefore it is also a lie. Either way, neither the deliverance clip nor scripture can possible lead us to believe TB Joshua really is here to liberate the world – that job started on the cross of calvary and continues to this day, no thanks to (false) prophet TB Joshua. This video is just another shocking example of SCOAN promoting TB Joshua as a messiah, remember he has already been named the “Jesus of our generation” and the “messiah of our time” on Emmanuel TV, and no attempt has been made to correct these statements.